One drink to rule them all. Possibly shopped. Can anyone confirm? Good to know what soft drink the people of Middle Earth enjoy. Yes... It can only be destroyed by falling into the volcano Mt. Pepsi. "Definitely fake, the characters that look like capital Cs don't exist in elvish." -- Wow. The fact that you know this makes me feel sorry for you. Enjoy your lifelong celibacy. È un messaggio! Terrazzo...sgabello...formaggio...borraccia blu...cazzo di gomma....eeeeeeh...cannuccia! Definitely shopped. that blue rectangle was never in the movie. I dont think the orange words, line and circle were there as well but im not sure. I can't tell what's harder to read, the ring or the text. Definitely fake, the characters that look like capital Cs don't exist in elvish. 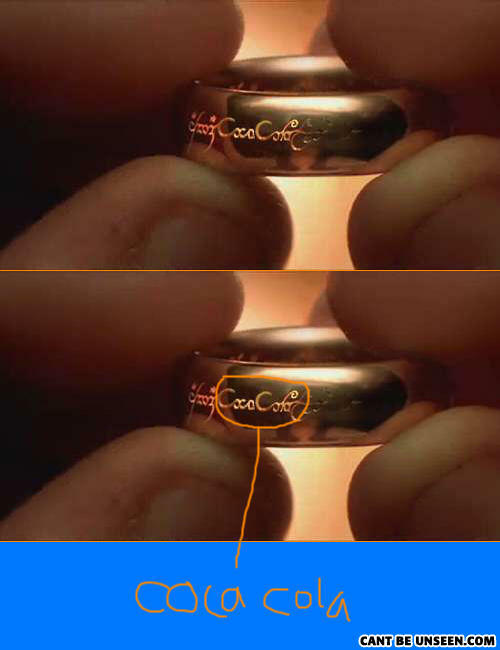 ONE RING TO RULE ALL SODA. You're under arrest for second degree murder.